The Internet of Things (IoT) will impact all industries, including farming. As an example, robots and drones have already started to transform parts of the global agriculture sector. According to the latest worldwide study by IDTechEx Research, it's already a $3 billion market in 2016, and it will grow to reach $10 billion by 2022. IDTechEx analysts believe that agricultural robots and drones encompass many different technologies -- each serving a different sub-market, and each enjoying a different degree of technology and market readiness. 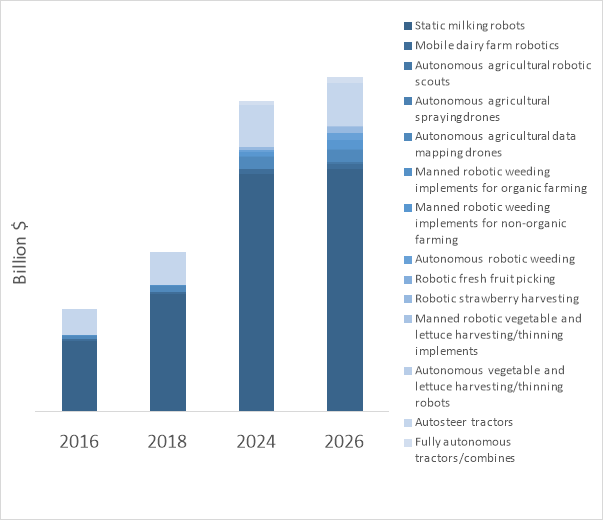 Dairy farms: Thousands of robotic milking parlors have already been installed worldwide, creating a $1.9 billion industry that is projected to grow to $8.5 billion by 2026. Mobile robots are also already penetrating dairy farms, helping automate tasks such as cattle feed pushing or manure collection and removal. Autonomous tractors: More than 300 thousand tractors equipped with auto-steer or tractor guidance will be sold in 2016, rising to more than 660 thousand units per year by 2026. Unmanned autonomous tractors have also been trialed with large-scale market introduction largely delayed by the lack of farmer trust. However, this will all change by 2022 and sales of unmanned or master-slave tractors will reach $200 million by 2026. Agricultural drones: Unmanned remote-controlled helicopters have been spraying rice fields in Japan since early 1990s. Autonomous drones have provided aerial maps, enabling farmers to take data-driven site-specific action. Deployment will grow as regulatory barriers lower and precision farming evolves. Hardware will become commoditized, and value will shift to sensor data acquisition and analytics software providers. Agriculture will be a major market for drones, reaching $485 million in 2026. Robotic weeding implements: Vision-enabled robotic implements have already been used in organic farming. They follow the crop rows, identify the weeds, and aid with mechanical hoeing. The next generation of these advanced robotic implements is already in its early phase of commercial deployment. It will be using large troves of data to train its algorithms using deep learning techniques. This will become a $380 million market by 2026. Unmanned autonomous robotic weeders and data scouts: Vision-enabled and intelligence robots are reaching navigational autonomy. These small robots will be autonomously roaming farms, analyzing plants and taking specific actions such as eliminating a weed. Already, numerous groups have developed and deployed a variety of weeding robots. Whilst most products are in a trail phase, the first notable sales have also taken place aimed at small multi-crop vegetable farmers. This will become a $300 million market by 2026. Fresh fruit harvesting: Fresh fruit picking has remained mostly out of the reach of machines. Progress has been hampered by the stringent technical requirements, together with the lack of CAD models. However, this is beginning to change. A limited number of fresh strawberry harvesters are already being commercially tested, while fresh apple and citrus harvesters have also reached the level of late stage prototyping. Market adoption will start in 2021, eventually reaching $230 million by 2026.